^^^^^^Wait a minute, employing my basic detective skills; the bat..., the glove....could it be future R3 Brother "69Mets"? I'm not too sure "JohnnyGage" but is it "69METs" - OR- could it be this site owner, now FDNY Lt Tommy B, aka "tbendick" ? The only reason I think maybe "tbendick" because it looks to be Engine 23 and I know his father, Retired Capt John B "jbendick" who worked at Engine 23, used to take his son Tommy B to ride with him. But either one, "69METS" - OR - "tbendick", both followed in their fathers footsteps. Both "into the job", and being well respected members of the FDNY. Another interesting point is that "69METS" worked with then Firefighter John B (Retired Capt John B) at the "animal house" (E75/L33/B19) as it was nicknamed then on Jerome Ave.
By the way Dan, aka "JohnnyGage", guys are telling me how much they appreciate your stories of Glory Days. Seems you got plenty of fans out there. I agree with you, Willy. JohnyGage's posts have been interesting, informative and in many cases humorous. He's a great addition to the site, and I have the impression that he couldn't be bribed with a couple of Big Macs . . . unlike some others who shall remain nameless. Thank you gents for your kind thoughts!... Big Macs, white castle, fuhgetaboutit, I'd fold like a cheap suit!, two staples of life....Glad you enjoy the articles...I have only touched the surface. After dinner, well maybe before... a couple of JWB, I sit in my recliner with my little black cat on my lap and type away, thinking about the Glory Days...Recollections of Glory Days pour into my coconut, so many I had to list my stories into a journal to relieve my brain...believe me when I say; we have only touched the tip of the iceberg!..I have more crazy recollections of "TT", "Profiles", "Odd couples", "Vacants", "Car fires", "Meals" and the defining moment of what "Glory Days" meant to me...plus more...they are already in the can! ...I appreciate all feedback, it is very encouraging...thanks for reading, I hope you enjoy, and stay tuned, the crazy stories have just started! 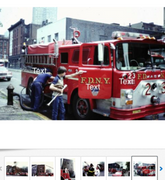 "JohnnyGage" thanks again for your posts of the "Good Old Days"
Came upon this photo in a forum called "The Bronx Board", unknown who took the pic, but it's a FDNY tiller turning onto 180 St off of Mapes Avenue. I m going to assume it is L 38, back then they had a very large first due area. During those years, the next nearest truck company would have been L 27...still a distance from this corner. The rig seen here is a 1937 Seagrave 85ft. stick so it must be L27. The only other Bronx Ladder co. that was assigned a 1937 Seagrave was L31. L38 was running with a 1921 ALF 75ft. with a 1932 FWD tractor. Its a pleasure to be a small part of this wonderful group! alright, alright, already - enough with the nicey nicey stuff JG - we're all sitting around waiting for that can of yours to pop open and toss out another pearl of entertainment for us. Keep signing in and nothing from JohnnyG - what the heck! It's like when I was a kid and came time for "Have Gun Will Travel" with my main man Paladin to come on and the freakin' tv is on the fritz again - scrambly picture, can't get the vertical hold to actually hold - tweaking the aluminum foil antennae ears isn't working and now I gotta go listen to Cousin Brucie on the transistor radio instead. Bruce Morrow was good but he wasn't Paladin - the knight without armor in a savage land. Same with you JG, nobody's here is taking your place - right now there's a lot of Good Guys, but as for me - your the new Paladin. Not sure JohnnyG, but Paladin mighta been a chief in the San Francisco FD, think his aide/driver was "Hey Boy" - guess he had a lotta comp time because he wasn't around that often, had some other work to tend to - think the SFFD dispatcher was often heard trying to reach Paladin, asking him "Paladin, Paladin, where do you roam"? I don't think he ever answered. Thanks for the latest Glory Days - always enjoyable reading!!! Of course he answered! He said "far, far from home", didn't he? And you're right . . . always enjoyable reading.